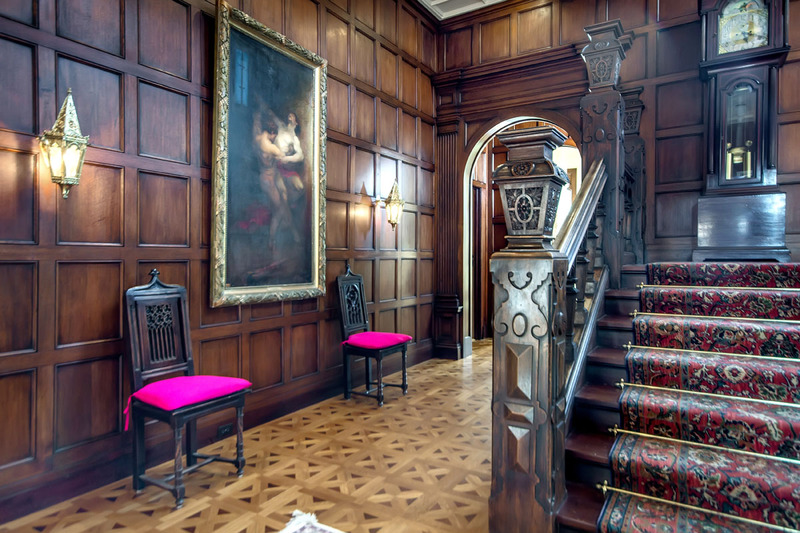 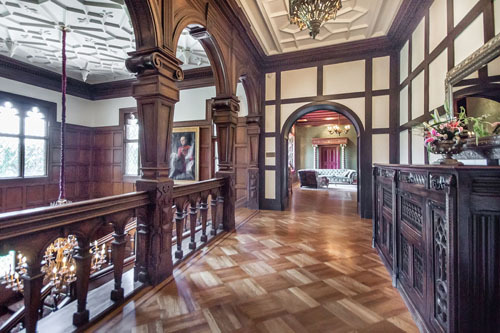 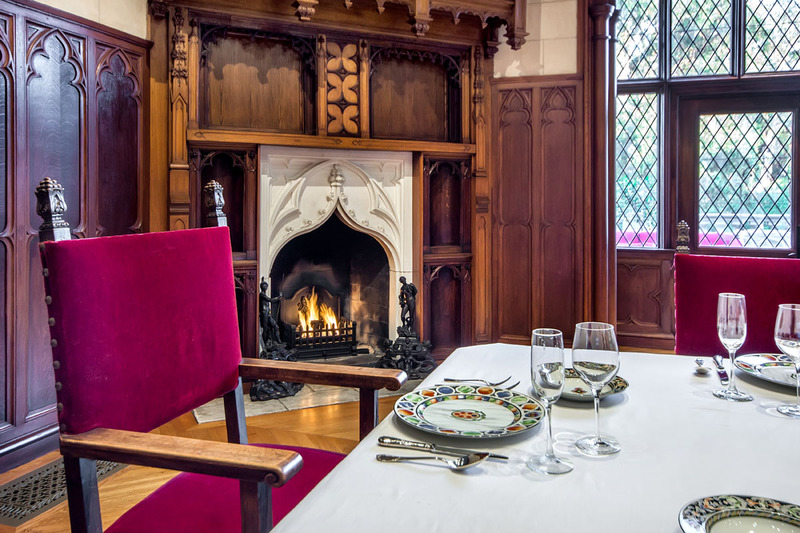 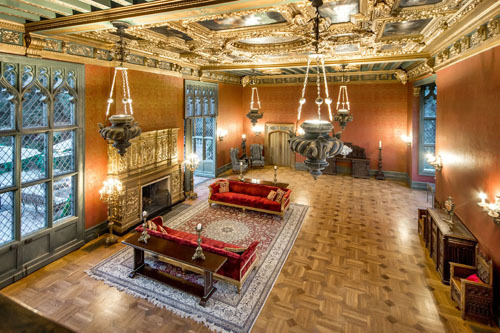 Jacobean in design and replicated after the style of Penshurst in Kent, England, the entry hall and stairway extending to the top of the second floor are paneled in antique California oak. 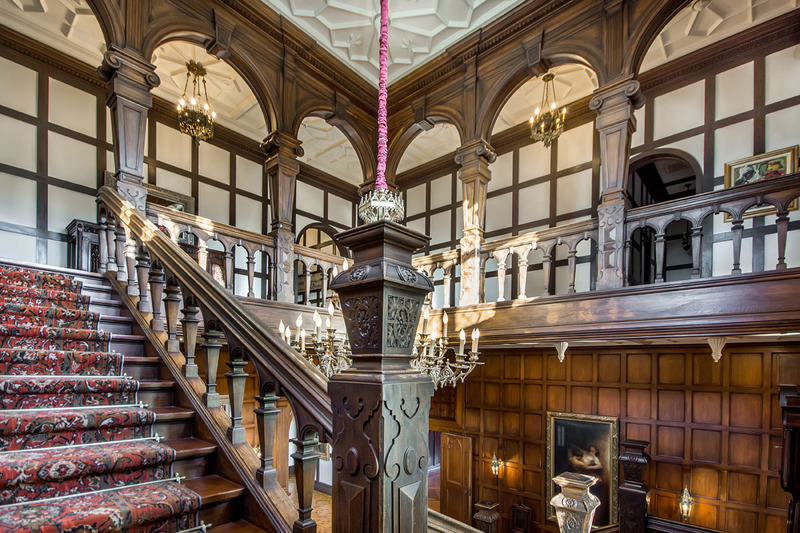 Intricate octagonal oak and ebony design graces the floor. 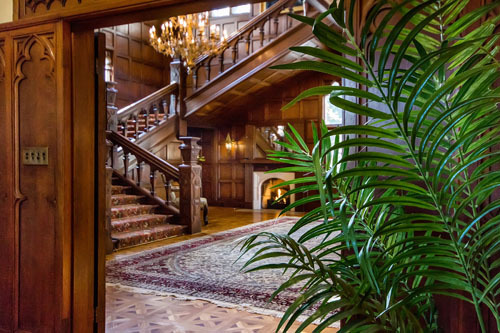 The grand scale and woodwork detail of the foyer is eye opening but the natural wood design makes arriving guests immediately feel comfortable. 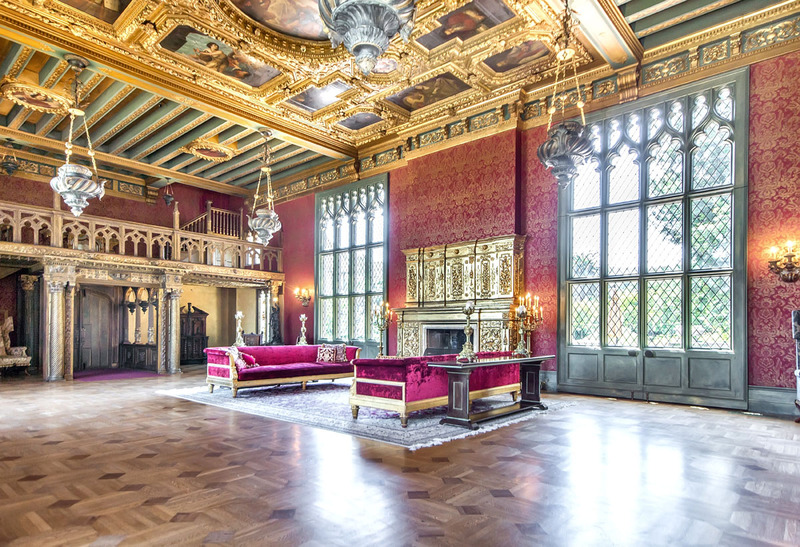 The oak parquetry floor is inlaid with ebony wood and the gilded fireplace from a palazzo near Florence is the focal point of the wall. 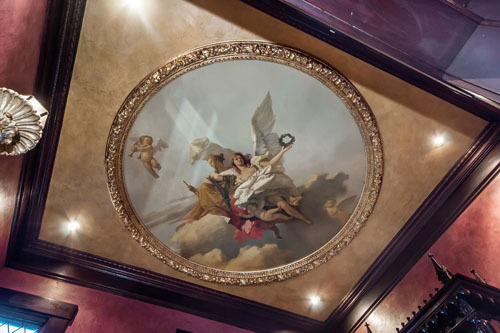 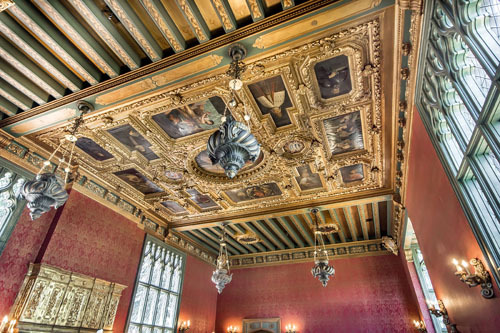 Under this one of a kind historic 500-year old golden ceiling from Grimani Palace in Venice built in the fifteenth century adjacent to the Rialto Bridge, the Pope presented Marino Grimani and his wife a golden rose. At one end of the ballroom, a loft holds the minstrels’ gallery featuring a Van Amstal balcony from Holland and scenes in 12th and 13th century German stained glass are embedded in its windows. 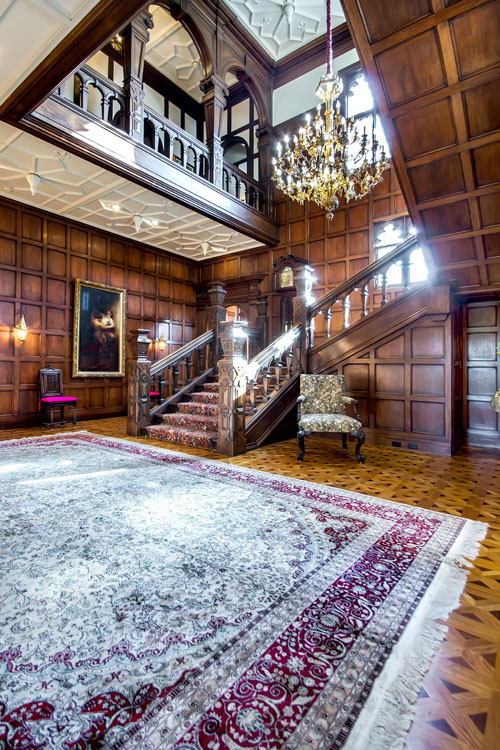 This incredible multipurpose room lends itself to hosting events of any size with a stage for entertainment and live music or could serve as a luxuriously large living room. 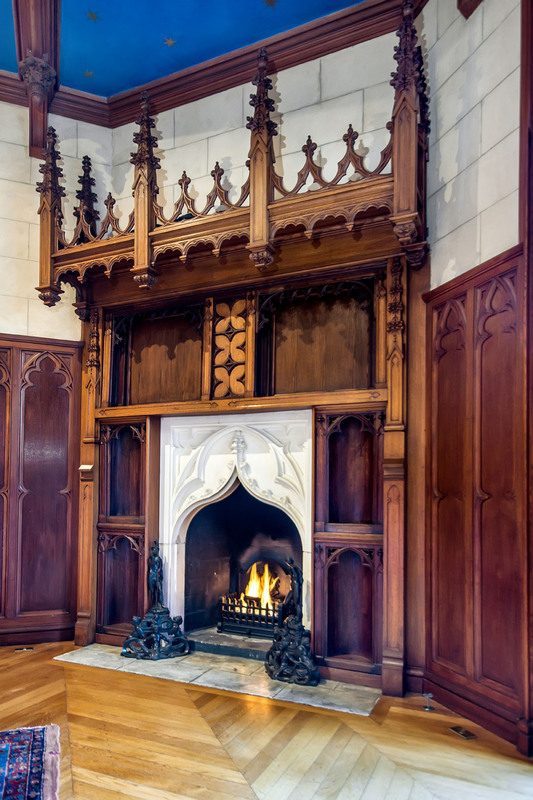 The large carved marble mantel originally from a castle in Germany and a hand painted wooden beamed ceiling give this formal living room endless character and appeal. 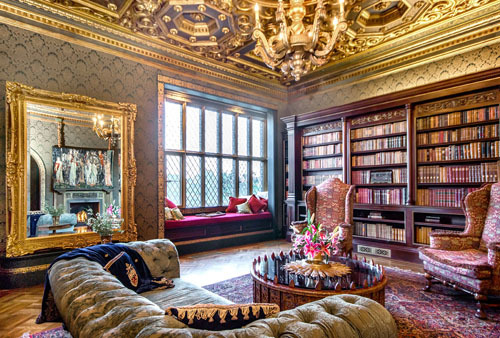 Rich mahogany bookshelves and fine fabricfabric line the walls of the library; the room is capped by a centuries-old carved gold ceiling from the Grimani palace in Venice, Italy. 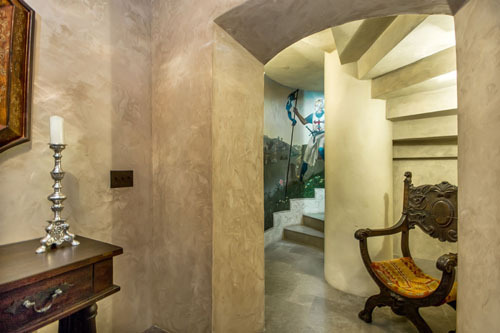 The bookcases include a secret door that opens to a speakeasy-style wet bar. 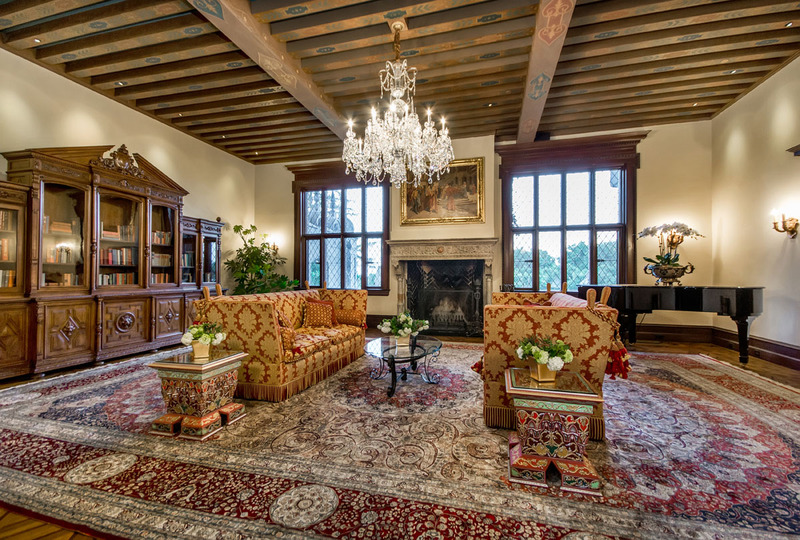 The library with its hidden wall mounted TV is ideal for either entertaining a small group of friends or colleagues with beverages and hors d’oeuvres or curling up with a good book in the cozy window seat near the massive fireplace that looks out upon the garden. 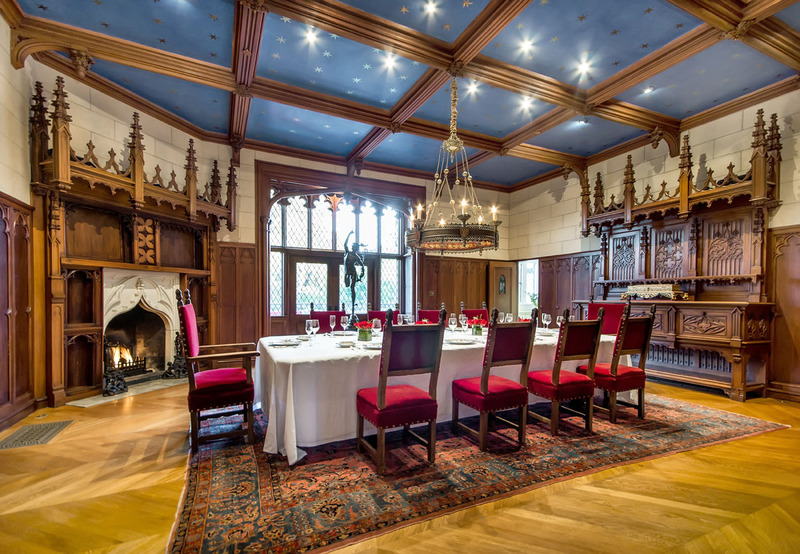 Entering through a gorgeous 700-year-old carving from Brugges in Belgium above the doorway, the formal dining room is topped by an evening blue sky ceiling with gilded stars and gold leaf. It is ideal for large family gatherings, formal dinners or as a conference room to host business meetings. 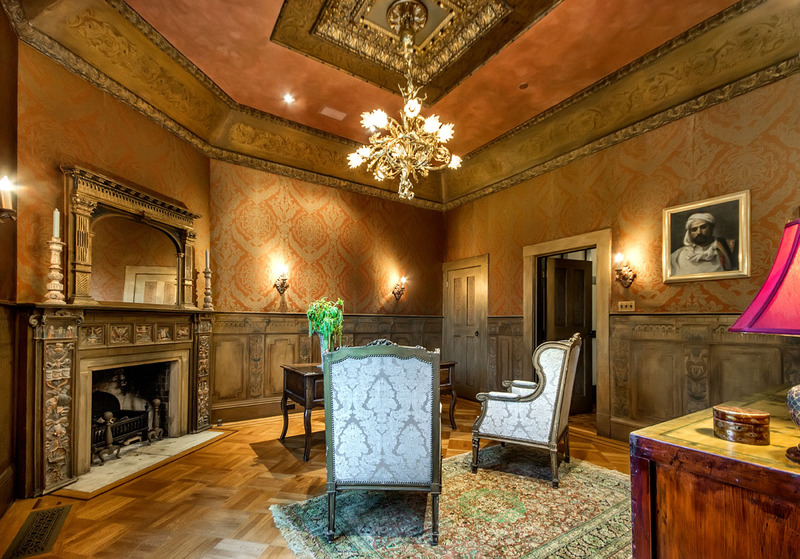 The upper silk fabric walls that blend with the original wainscoting painted by Dutch painter Van Amstel set the unique intimately warm tone of this office that includes a private powder room and a large wood burning fireplace. 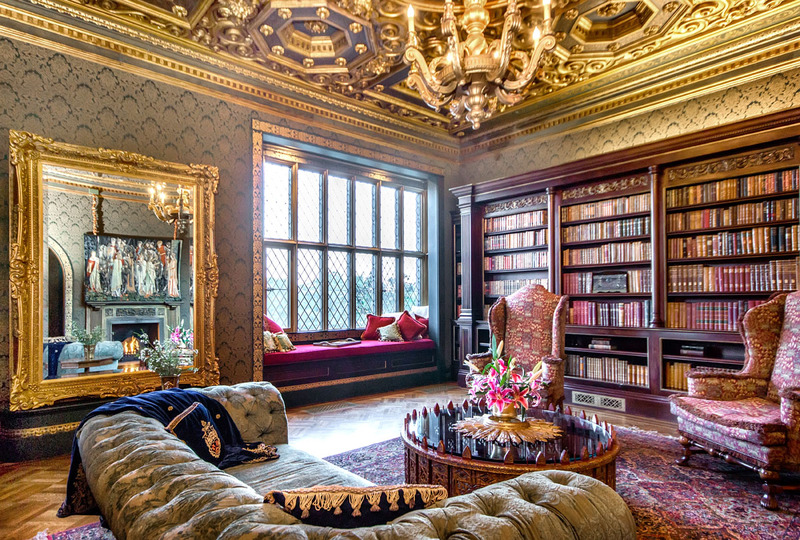 Designed as her office or can be enjoyed as a private reading room for the library. 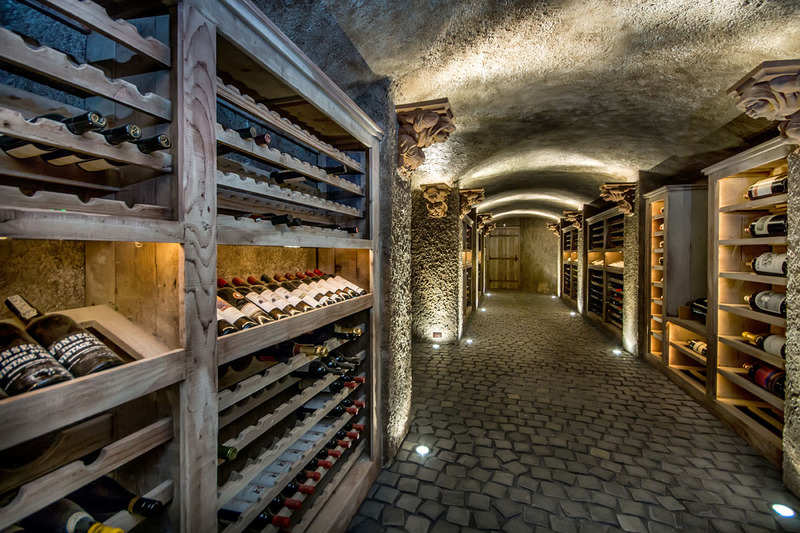 A spiral staircase leads the way to this grand temperature controlled 2000 bottle wine cellar that was built around the crouching monk corbels that adorn the walls as light fixtures with custom wine racks designed by Kyle Ditzler. 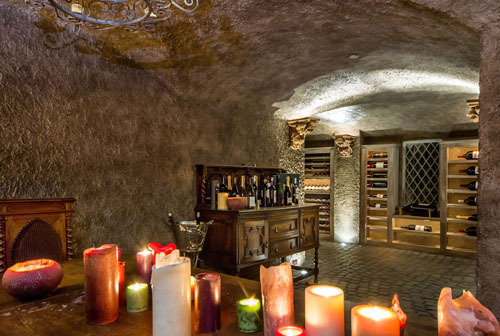 This world-class wine cellar is ideal for the serious collector or for entertaining your friends over charcuterie platters and wine in the rustic tasting room.